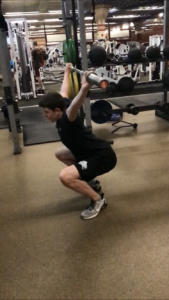 My name is Kohl Johnson and I am a 15 year old athlete from Thunder Bay, Ontario, who has a passion for fitness. I have loved sports throughout my whole life, I played numerous ones growing up; as I got older I started focusing on hockey specifically. As I went up through the age levels I eventually made it onto the AAA team in my city. Around that time the game got faster and the players got bigger and stronger. The main reason why I started working out was to help with hockey, I was skinny so needed to get bigger and stronger to help keep progressing through hockey. I started with bodyweight workouts given to us by my team, I was eager to do them and always strived to surpass the number of workouts we were to do in a week. When I turned 13 I was finally old enough to get a membership at one of the local gyms. I loved to see the progress, getting bigger with a solid physique to match, I also loved seeing my strength numbers go up. It was clear the gym was another passion of mine. With progression in the gym a priority of mine I started looking for ways to accomplish that. I ended up also loving educating myself and learning more and more when it came to fitness. This education I was obtaining through self research made my workouts safer, more efficient and effective as well as added structure. This in turn allowed me to progress at a slow and steady concrete base, exactly what I was looking for. Fast forward to now, I have 2 years of training and knowledge under my belt and my results have been amazing. Not only that but I am still learning and progressing at a good pace. I figured I am at a point now where I have enough knowledge and experience that I can start helping others along the way in their fitness journey. That’s why I created this website, I want to give you guys the information that I have used and know will be beneficial to you. The goal of this website is to help you along on your fitness journey. I am not a certified personal trainer, nor do I have an university education behind me. What I do have though is a variety of self obtained knowledge and experience. Which I hope to be a benefit by laying out the information you need in a simple easy to understand, well structured way. I think this will provide a unique perspective for you to learn from, not just information that is learned through school education, but information that has been acquired through self research and applied to myself that I will be giving all of you. I thank you for taking an interest to my site and hope that you find my content interesting and useful. My goal is to give you information that will have a lasting effect on your fitness journey. Keep crushing it!